Search engine optimization is critical for any periodontist that hopes to draw new patients from the Internet. As a specialty practice, periodontic search keywords receive significantly less search traffic than general dental terms, meaning that periodontists are competing for fewer potential new patients than general dentists in the same area. A general dental practice that ranks lower on page one of Google can still attract a decent number of website visitors every month, but a periodontist on the bottom of page one results will get almost none. That is why it is imperative for periodontists to maximize their search engine rankings – and that is DDSRank’s specialty. 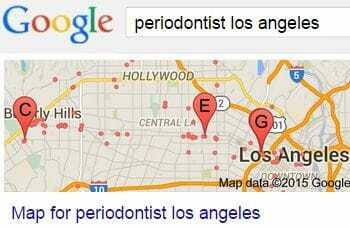 A good Periodontic SEO campaign begins with thorough keyword research. As specialists in dentist seo, our experienced staff know how to search for the relevant perio terms prospective patients in your market are typing into the search engines. Finding these search terms will allow us to update your website to hone in on the best searches, and to show up on Google for the phrases people are actually looking for. Once we find the best periodontic search keywords for your market, we can properly audit your website to determine if the site is optimized to rank for them. We analyze the pages on your website, the images, the title tags, and all the other under-the-hood markup elements on your site to make sure that they correctly target the keywords people in your area are researching online. We also go through the content on your site, to ensure it properly supports your search terms. Our expert periodontic SEO gurus tweak your website until it paints the perfect picture for Google, Bing, and Yahoo to recognize that you should be the top result for your target keywords. When we go to work for you, our aim is make you the most successful periodontist practice in your area. The only way we can do that is by promising that we will do SEO for any other periodontists you compete against. This gives the DDSRank SEO team the freedom to fully commit to maximizing your rankings and online exposure. So if you are looking for the best periodontist marketing team to work for you, contact us today!